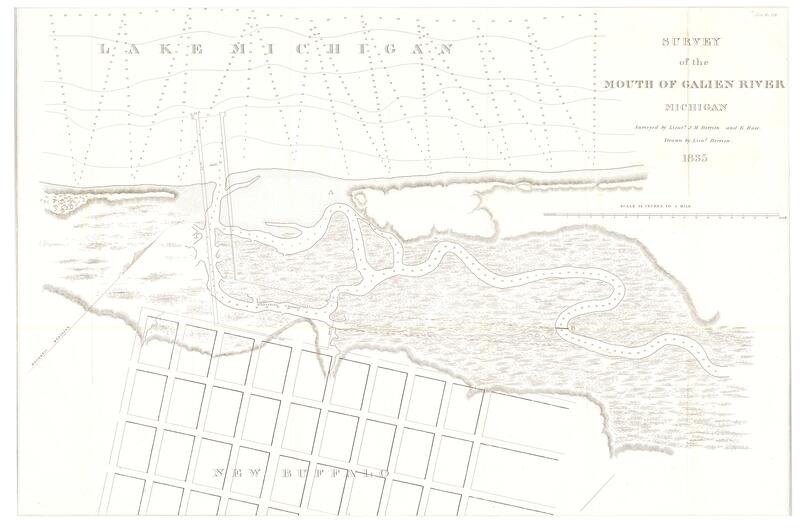 Survey of the Mouth of Galien River Michigan; surveyed bt Lieuts. J. M. Berrien and E. Rose. Drawn by Lieut. Berrien. Berrien, John Macpherson, -1876.,Rose, E.,United States. Army. Corps of Topographical Engineers. From: U.S. 24th Cong., 1st sess., 1835-1836. H.doc.124. -- (Serial set; 289). Originally from a "Letter from the Secretary of War transmitting a report in relation to the construction of a harbor at New Buffalo, Michigan Territory," written by Lewis Cass, J. J. Abert, and John M. Berrien. "Doc. No. 124" 1 map; 50 x 75 cm. This map is in the public domain. Please attribute access and use of this digitized map to the Stephen S. Clark Library, University of Michigan Library.